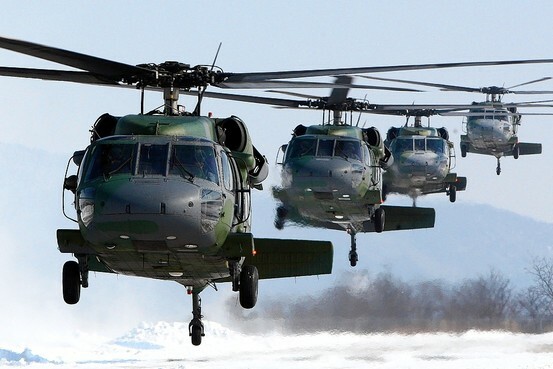 Blackhawk UH-60 helicopters, such as these flown in South Korean military exercises last winter, are part of a proposed arms sale to Saudi Arabia. The Obama administration is set to notify Congress of plans to offer advanced aircraft to Saudi Arabia worth up to $60 billion, the largest U.S. arms deal ever, and is in talks with the kingdom about potential naval and missile-defense upgrades that could be worth tens of billions of dollars more. The administration plans to tout the $60 billion package as a major job creator—supporting at least 75,000 jobs, according to company estimates—and sees the sale of advanced fighter jets and military helicopters to key Middle Eastern ally Riyadh as part of a broader policy aimed at shoring up Arab allies against Iran. The talks between the U.S. and Saudi Arabia have been widely known for months, but many new details are only now coming into focus. These include the number and type of aircraft involved, how much the Saudis intend to spend in an initial installment, and the ongoing negotiations to also upgrade the kingdom’s navy and missile defenses. The $60 billion in fighter jets and helicopters is the top-line amount requested by the Saudis, even though the kingdom is likely to commit initially to buying only about half that amount. In a notification to Congress, expected to be submitted this week or next, the administration will authorize the Saudis to buy as many as 84 new F-15 fighters, upgrade 70 more, and purchase three types of helicopters—70 Apaches, 72 Black Hawks and 36 Little Birds, officials said. The notification triggers a congressional review. Lawmakers could push for changes or seek to impose conditions, and potentially block the deal, though that is not expected. On top of the $60 billion package of fighter jets and helicopters, U.S. officials are discussing a potential $30 billion package to upgrade Saudi Arabia’s naval forces. An official described these as “discreet, bilateral conversations” in which no agreement has yet been reached. That deal could include littoral combat ships, surface vessels intended for operations close to shore, the official said. Talks are also underway to expand Saudi Arabia’s ballistic-missile defenses. The U.S. is encouraging the Saudis to buy systems known as THAAD—Terminal High Altitude Defense—and to upgrade its Patriot missiles to reduce the threat from Iranian rockets. U.S. officials said it was unclear how much this package would be worth. The U.S. has sought to build up missile defense across the region, and the Saudi package could be similar to one in the United Arab Emirates, officials said. THAAD is built by Lockheed Martin Corp. and Raytheon Co. supplies the system’s radar. THAAD is the first system designed to defend against short- and intermediate-range ballistic missiles both inside and outside the Earth’s atmosphere. It complements the lower-aimed Patriot missile defense system, providing a layered defense. Lockheed officials have stated that they see serious export potential for the system in the Middle East, where a major concern exists about Iran’s ballistic missile development. The prospect for job growth could help build support in Congress for the $60 billion package, officials said. “It’s a big economic sale for the U.S. and the argument is that it is better to create jobs here than in Europe,” said one person close to the talks. Boeing Co., which makes the F-15s, the Apaches and the Little Birds, believes the Saudi package would directly or indirectly support 77,000 jobs across 44 states. It is unclear how many jobs, if any, would be supported by the Saudi purchase of Black Hawks, made by Sikorsky. Production levels are already high at Sikorsky, which is owned by United Technologies Co. The Saudis in recent years have broadened their acquisitions to include more European- and Russian-made weaponry. That thinking was partially behind Riyadh’s 2007 deal to purchase dozens of Eurofighter fighter planes from BAE Systems PLC, Saudi officials said. Pro-Israel lawmakers have voiced concerns in the past about arms sales to Saudi Arabia that they say may undercut Israel’s military edge and provide support to a government with a poor human rights record. U.S. officials say the Israelis are increasingly comfortable with the Saudi sale because the planes won’t have certain long-range weapons systems. Also, the Israelis are in line to buy a more advanced fighter, the F-35, and should begin to receive them around the same time the Saudis are expected to start getting the F-15s. “We appreciate the administration’s efforts to maintain Israel’s qualitative military edge, and we expect to continue to discuss our concerns with the administration about the issues,” said Michael Oren, the Israeli ambassador to the U.S. The $60 billion deal will be stretched out over five to 10 years, depending on production schedules, training, and infrastructure improvements, officials said. Anthony Cordesman, a scholar at the Center for Strategic and International Studies, said the deal is so large and so complex, that changes are inevitable. “The actual contract often is renegotiated because the Saudis are always going to push, we’re always going to push, the Congress is going to push, the manufacturer is going to push. This is not the kind of negotiation where you’ve really agreed on the final details until you actually have put the final contract out,” he said. —Nathan Hodge contributed to this article.